Then you have come to the right place because I have a firm belief that making soup is absolutely therapeutic. So this particular session is FREE, on the house—if you consider that the grocery bill actually pays for your dinner not your therapy. For me the preparing of soup is totally therapeutic. The whole process is magical…it is really…try it if you have not. Let me walk you through this one and maybe you’ll be hooked on making your own soups from now on. You begin with a gorgeous array of fresh seasonal vegetables—if you don’t have them, start your therapy session by perusing a local Farmer’s Market. Bring your own bags please; you wouldn’t want to offend the natives. Once you’ve gathered your lovely bevy of dirty and rustic veggies, wash and peel. 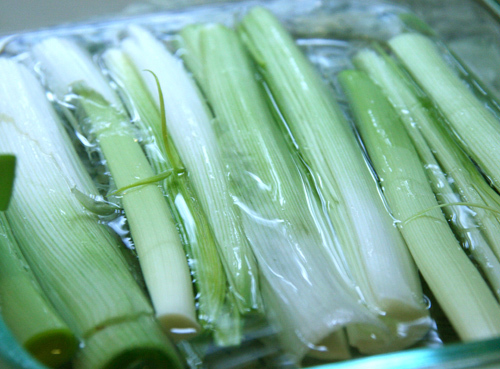 Chef’s note: If you have never worked with leeks before, you probably don’t know that dirt is hidden between all the lovely layers. So chop off the ends first, separate the layers and soak them in a rectangular dish filled with water while you chop everything else. Now put on your favorite music. This is absolutely essential in the whole making soup as therapy process. Hum or sing aloud! There is evidence as noted in Discovery Health that all types of singing have positive psychological effects. The act of singing releases endorphins, the brain’s “feel good” chemicals. So please, if you are truly in this for its therapeutic effects, sing away. Just ignore the grumpy teens who claim your voice sounds a bit like a dying cat. Tell them this is the perfect opportunity to plug-in and tune you out. OK…veggies are clean and peeled, now it’s time to chop. 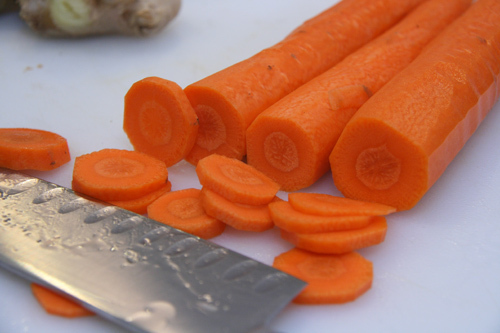 To make the carrots easier to chop, I line them up parallel to each other and cut all three at the same time. Voila, all three carrots are chopped in seconds. 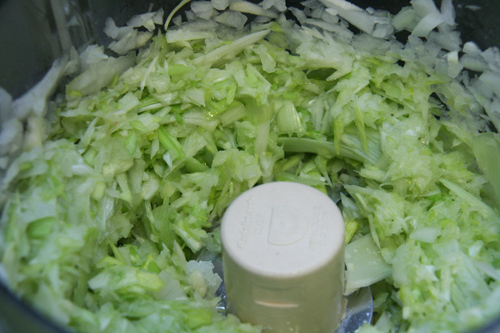 If you have any type of food processor or chopper, let it do the work of chopping the garlic, onions and leek(all together is fine). If you have to chop these by hand, I’m sorry—maybe the onion chopping can be your cathartic cry you need. 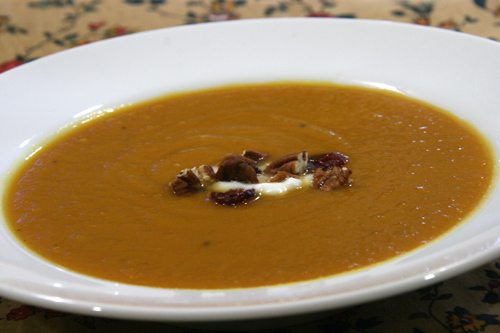 But don’t dwell on the tears, move along and complete the task at hand…delicious creamy sweet potato soup. Once you have all of your veggies chopped and ready for action, put the butter in a big stock pot and saute your onions, leeks,carrots and garlic with one bay leaf until soft. Inhale…I mean this literally. Close your eyes and really take in the wonderful aromas of garlic and leek being cooked in the butter. Mmmmm. After you chop your potatoes and apple into inch-like cubes, throw in the sweet potatoes, apple, russet potato and chopped ginger into the pot. Lightly add salt and freshly ground pepper to taste (some people like to use white pepper to avoid the black pepper flakes in the soup). Saute everything together for a couple of minutes. Oh my, the fabulous smells should be permeating your whole kitchen and moving throughout the house by now. Everyone in your household is fully aware that something wonderful is afoot in your kitchen, and you are beginning to feel pretty damn good about yourself. See? Your self-esteem is beginning to take a shot upward. I’m good, aren’t I? 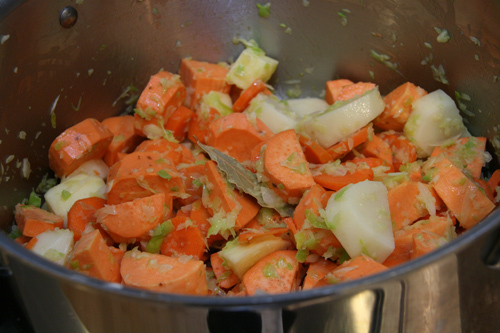 Add the vegetable soup stock and simmer with the lid on for 30 minutes or until the potatoes are fork tender. Add the honey. Last but not least, puree the entire pot either with an immersion blender (you lucky devil you) or carefully pour small batches of the soup into a blender and puree. DO NOT POUR THE ENTIRE BATCH IN AT ONCE, AND DO NOT FORGET TO PUT THE LID SECURELY ON THE BLENDER (Removing the little cap with a folded towel covering the opening)! Burning your face and ending up in the E.R. will not help with the good vibe we have going here so please have all your wits about you for this step. Finally, your soup is complete! Taste and add salt and pepper to your liking. Serve it up in bowls and garnish with a dollop of nonfat plain yogurt, sour cream or creme fraiche. Then sprinkle a few dried cranberries and chopped toasted pecans on top of the yogurt. You are ready for the final step in the therapeutic process…eating the soup slowly, sip by sip with a large chunk of rustic, crusty bread. In the end, both your mind and soul should be filled up and satisfied. Your worries will at least have taken a good one hour break from harassing you, you will have fed yourself and your family, and you will owe nothing at the end of the cooking/therapy session. Inspired by a recipe from Gourmet Magazine but totally Geni-fied. 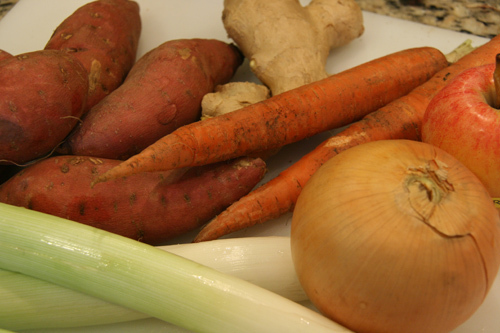 Make the soup: In a large stock melt the butter and cook the onion, leek, garlic and carrots with the bay leaf on moderate heat, stirring, until the vegetables are softened (about 3 minutes). Add the sweet potatoes, russet, apple and ginger. Stir and saute for a minute. Pour in vegetable broth and simmer the mixture, covered, for 30 minutes or until the potatoes are fork tender. Add the honey and stir. Discard the bay leaf. In a blender, puree the mixture in batches until it is very smooth, transferring it as it is pureed to a large saucepan or serving tureen. Or if you have an immersion blender, just puree directly inside the pot. Add salt and pepper to taste. Serve in bowls, dolloping one teaspoon of nonfat yogurt. Top with dried cranberries and toasted pecans for garnish. Great looking soup. Katherine wants to do something similar for Thanksgiving, for a starter. Because you need courses on Thanksgiving! You captured me into your good vibe lesson of soup making.,I’m a lover of hearty soul warming soups..and this looks as if would truly satisfy any hungry for love taste buds! There really is something about soup that is just so comforting to the soul, and delicious too! Great post. I thought originally it was because sweet potato is a soothing therapeutic ingredient- it’s good for stomach/digestion issues! But anyways, this sounds delicious and I can practically smell it based on your write up- yum! Looks great and perfect for this fall! Comfort food is so satisfying. This looks like a wonderful recipe. Lovely soup! Soup is one of my favorite dishes to make. It’s so forgiving and definitely therapeutic. Soup is my favorite comfort food. This sounds delicious. This sounds like it would be therapeutic to cook AND eat. Love it. This looks so rich and healthy! 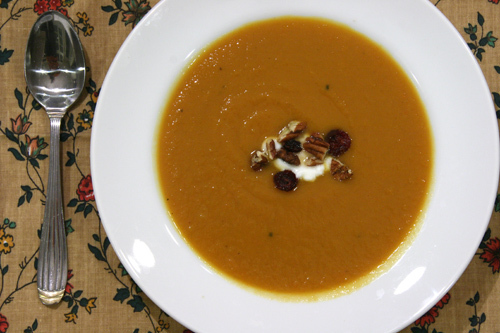 I can tell how soothing and delicious this sweet potato soup tastes! This looks so wonderful Geni. I’ve made Thursdays soup or salad night in our house. I think this one will be on our menu very soon. I especially like the addition of leeks and apples to this soup. Delicious! OMG, Geni, you had me absolutely ROLLING with this post! Absolutely hysterical – dying cat, good vibe and have all your wits about you. Man, you are SO funny!!! Thanks for the wonderful laughs, I needed that to get me motivated today. LOVE anything sweet potatoish, can’t wait to try! I do believe I felt the therapeutic benefits simply by reading this post! I love making soup and even though I could use my food processor, I love to chop away. This sounds delish with the apple swirled in the mix. I’m so looking forward to soup weather!! how I love making soup…. like you say…it is almost therapeutic…. but, mostly, I just love making it. It’s never really the same twice with me…because I am usually tweaking things…or adding this or that… so even though it is similar… not quite the same…. but always delicious! Lately I’ve been making my Caldo Verde… or green soup that I discovered when I went on holiday to Portugal. First holiday in 10 years… and soooo much fun. Especially the food! what a fabulous post and delicious recipe! I’m so excited about sweet potatoes! I love potato soup, butternut squash soup, and pumpkin soup. I think this will probably top then all. This soups looks fabulous. I love all the veggies that you packed into it. My WP reader is being finicky again, so I’m not getting a notice when you add a new post. 😦 And this would’ve been perfect for us yesterday. Looks tasty!! Oh, and congrats for being featured at This Chick Cooks! Oh how lovely! I’m going to subscribe myself one bit pot of soup. And reading what you wrote about inhaling the smell made me realise it may just be what I need to make my new house smell like home. To me, when I walk in the door, it still smells like someone elses house. Genius! I’m positive this is going to work.